In Virgin Land, Henry Nash Smith explores the legendary image of the mountain men that led easterns to believe that they were lone wanderers prowling the western desert seeking adventure and intrique. Although this was the popular conception, it was simply not the case. These men were very rough, adverturous businessmen, and they needed an economic framework, however loose and transient, to support their occupation. The furtrade and the companies that resulted from it provided the fiscal support and stability that the mountain men needed to crisscross the continent in search of adventure and profit. There were essentially two realms of trade: The Rocky Mountain Fur Trade and the Upper Missouri. The two regions had different circumstances and hence very different methods of operating business. The Upper Missouri trade relied on the Indian tribes to bring their buffalo skins to trading posts. There, the robes were bought and sent to St. Louis via the river. The Rocky Mountain Trapping system was quite different. In the Rockies, beaver was the fur of choice. It was trapped mainly by the Euro-American mountain men traveling in company groups. The pelts were sold at a yearly rendezvous where the buyers would travel overland to the designated site and then haul the furs via mule train and wagon to the city to be sold. This system allowed the mountain men to stay in the wilderness year round, as they did not have to travel to a trading post to sell their catch. These two systems were not sealed from one another. 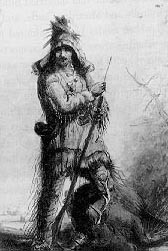 Depending on the terrain, available capital, and the attitude of the nearby Indian tribes, a fur company would often use both the rendezvous system and trading posts. The first of the fur giants was the British Hudson's Bay Company, chartered in 1670. The Hudson's Bay Company dominated the trade of Northern Canada and the Oregon territory well into the 19th Century. The first substantial American venture was the Pacific Fur Company started by John Jacob Astor in 1810. Astor's dream was to create a corporation that covered all of the West, starting with a fort at the mouth of the Columbia River. He sent one group by ship to build the fort and another by land to establish a useable overland route. The fort "Astoria" was erected as planned and the overland group arrived in 1811. The French North West Company was already trapping in the vicinity and provided keen competition for Astor. With the coming threat of British invasion during the War of 1812, Astor sold his fort to the North West Company for a fraction of its cost. The British did invade and take over the fort, renaming it Fort George. After the United States won the war, the post was returned to America, but not to Astor. The American fur trade was dormant from 1814 to 1819 due to the economic and political turmoil caused by the War of 1812. The loss of Astoria and trouble with the Blackfeet Indians on the Missouri also dealt a blow to the trade. Manuel Lisa did manage to run the Missouri Fur Company from about 1807 to 1820; this group built Fort Raymond in 1807 and trapped and traded with the Indians on the Upper Missouri. In 1822, John Jacob Astor again made a debut into the fur industry by establishing the Western department of the American Fur Company in St. Louis. A year earlier, the Hudson's Bay Company and North West Company had merged, resulting in British dominance of the Columbia River. Also in 1822, William Henry Ashley advertised for "one hundred young men to ascend the Missouri River to its source, there to be employed for one, two or three years." This marked the beginning of the Rocky Mountain Fur Company. Though it would change hands several times, this company would innovate the industry by creating the "free trapper system" and the rendezvous. Both Astor's new American Fur Company and the Rocky Mountain Fur Company would be successful in creating the Rocky Mountain trading system. As both companies branched out, they would eventually compete for control of the Upper Missouri trade. The stiff competition ended with the American Company's collapse in 1834. This was just as well. By 1834, the decline in demand for beaver hats (the fashion had turned to silk) combined with an increasing scarcity of resources (the beaver had been nearly trapped out) to weaken the market. In the early 1830's, beaver was worth almost $6/lb in Philadelphia; by 1843 the price was not even $3/lb.